I like to listen to music while coding.Â I always have.Â Sometimes Iâve worked at jobs where they allow this (media companies like BBC never mind developers with headphones) and some that donât (investment banks never allow this).Â So itâs nice when I get to do some coding at home on my own pc with my own set-up (Visual Studio 2008, twin monitors, etc) and my own music.Â So when Iâm at the desktop PC, I usually have iTunes open in another window. So I have a pretty big music collectionânot tied to a specific genre.Â Iâm hardly a connoisseur of music and would be out of place in any conversation about music, but I know what I like. Yesterday I heard about Spotify from a friend who raved about it.Â I downloaded the app and gave it a try.Â I think I found my new background-music application for writing code. 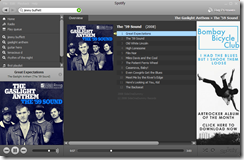 Spotify is a desktop application which streams music to the desktop. You can chose any song they have in their library (I have found most that Iâve looked for) and listen to whole albums, etc.Â When I heard about it, I thought is sounded a lot like Last.fm, which is an okay personalised-radio station service application.Â But Spotify seems to have no lag or buffering.Â It seems to download the tracks as needed in one go, without streaming.Â Not sure how the technology works underneath, but by watching the network usage on task manager, I see the network usage spikes only when a new track starts to play. My only concerned with listening to music on the internet is that Orange broadband is already complaining about how much bandwidth Iâm using in the evenings (since I spend a lot of time watching mlb.com, iplayer, and youtube videos). Iâve found some articles online that refer to Spotify as an iTunes-killer.Â I hardly think thatâs the case.Â If I was tied to this desk and never listened to music on my iPod in the car or while running, that would be the case, but you donât keep the music, you just listen.Â You can listen to albums or tracks and set up playlists. Spotify is also being referred to as a legal alternative to piracy.Â I can see that. Iâve only started using it a few days ago, but am very pleased with it.Â Iâm using the free account (ad-supported), but they have pro accounts for Â£10 a month.Â There are some adds inserted between the tracks, but Iâve listed by about 5 hours now and have only heard one. Itâs a nice service available in the UK now if you have a chance to take it out.